DeSilva+Phillips’ client, WDA, a leading mobile-marketing technology and services firm, has been acquired by [x+1], a digital marketing and data management platform provider. This acquisition will allow [x+1] to integrate WDA’s technology and media sources into the [x+1] Origin data management platform, adding mobile to its programmatic arsenal. This acquisition is the first since [x+1]’s recent funding and is the second acquisition in 2013. The deal was led by DeSilva & Phillips. WDA is a leading technical innovator in the fast-paced mobile advertising industry. The 12-year old company is deeply entrenched in the mobile market with direct ties to cellular operators and major media companies. Over the past 5 years, WDA has delivered a fully integrated technology suite that includes real-time bidding, developer SDKs for app marketing and rich decision-support system for marketers. 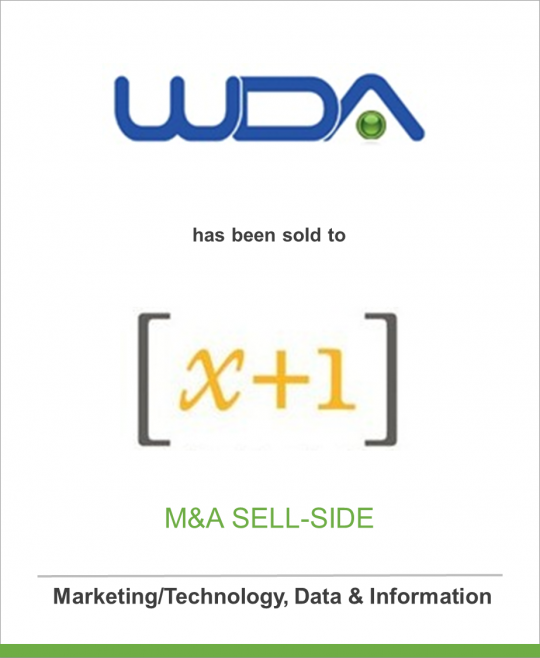 As an [x+1] partner, WDA has provided many [x+1] clients with the ability to deliver mobile mediaand analytics. This acquisition means WDA’s mobile marketing technology will be fully integrated into [x+1] Origin. This will provide [x+1] clients with the ability to identify, reach and react to their target audiences seamlessly across multiple devices including phones, tablets and the desktop. These capabilities — and more — will be fully integrated into the [x+1] DMP. This means all the data, insights and optimization made possible by Origin will seamlessly inform mobile actions as well, making mobile a new and powerful element in the complete programmatic marketing mix. For some marketers mobile means little more than display, for others SMS. WDA has distinguished itself by supporting the broadest range of use cases: from mobile buys, to effective mobile tracking and targeting to supporting app stores and app marketing campaigns for major brands. The company’s long-term relationships with wireless carriers have also given it deeper insights into the devices coming online and how they will perform. WDA’s technology suite integrates mobile media buying, mobile analytics, the app and mobile web ecosystems, social network marketing, mobilized traditional media such as QR codes, and closed loop marketing for implementing marketing programs that are repeatable, measurable, and attributable end-to-end. It offers a best-in-class platform for sophisticated automation and execution of campaigns, providing advertisers and their agencies all of the tools they need to be successful with mobile media. [x+1] enables Fortune 500 companies to programmatically manage customer and prospect interactions across all their paid and owned digital channels. The [x+1] Origin Data Management Platform (DMP), powered by the Predictive Optimization Engine (POE™), enables marketers to harness data to target, optimize and synchronize their offers, content and messages through websites, display, email, mobile, SMS, apps, call center chat and beyond — all in real time. Top companies in financial service, insurance, gaming, automotive, retail, telecommunication, online services and travel have significantly improved the performance of their digital marketing campaigns by working with [x+1]. The company is headquartered in New York City with offices in Connecticut and Illinois.